After shining as Jackie Robinson in baseball drama 42, Chadwick Boseman takes on an icon of a different sort in biopic Get On Up - the incomparable James Brown. With Tate Taylor (director of The Help) at the helm Get On Up is an unsurprisingly vibrant and energetic tale, yet struggles to maintain this dynamism throughout its heavy runtime. Ignoring traditional narrative chronology, Get On Up explores significant moments in Brown's life from his early upbringing in the backwoods of Georgia to signing his first record contract with The Famous Flames. Jez and John-Henry Butterworth's screenplay dips in and out of these events, whilst also tackling his solo stardom, relationship with his former band-mates, and the darker sides to his personality. 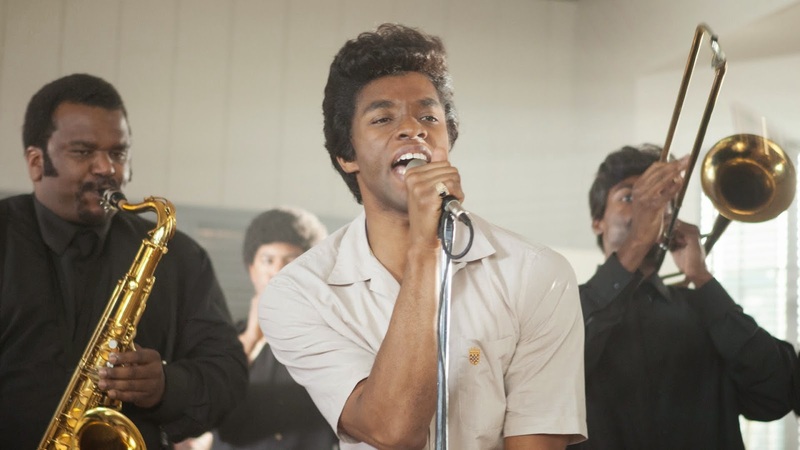 Given the somewhat erratic structure of the Butterworth's narrative, the style of Get On Up takes some getting used to. Opening in 1993 with Brown preparing to take the stage, the story then cuts to 1988 where we see Brown attack a strip-mall he owns (after an employee uses his private restroom), and subsequently dips back to 1960's Vietnam. These provide early indications of Brown's livelier side and showcases the vibrant-energy that Taylor brings to the singer's legacy through the biopic - before settling in on a slightly more conventional chronological narrative style. This vibrant style is subsequently one of the key assets of Taylor's feature, helping it establish a strong and original identity amongst conventional biopics. Contemporary events in Brown's life are given added depth from flashbacks to the singer's early life exploring what helped shape the performer. Taylor's utilises the bigger hits from Brown's back catalogue to further this energetic style - most notably in the film's lively performance sequences. Despite this, Taylor cannot help but overstay his welcome, with Get On Up perhaps gaining from a shorter, more focussed run-time. Many of the scenes between Brown and colleague Billy Byrd feel like overkill, as does the contrived reunion with his distant-mother. With this emphasis on energy and Brown's outrageous side, Get On Up is not as immersive as it could have potentially been in regards to the singer's music. An increased focus on Brown's fiery personality and passion, means that the story behind many of his hits gets put on the sidelines. A wealth of Brown's many R&B chart hits, as well as his numerous UK single successes throughout the seventies and eighties like Living in America and I'm Real are disappointingly overlooked. Get On Up is Boseman's show. The actor captures the heart and soul of Brown - from his driven energy, passion for funk, and wild charisma. As well as capturing Brown's spirit vocally and physically, Boseman successfully channels the singer's transition from small-town boy to musical icon with enough grit and depth to engage throughout.